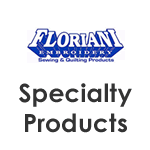 Floriani Stabilisers are high quality embroidery stabiliser, created in the USA. Embroidery stabilisers can be segregated into four primary groups; water soluble, heat removable, tear away and cutaway. It is important to use good quality stabiliser on your design projects, it gives better support for the design and stops your fabric from warping during stitching. 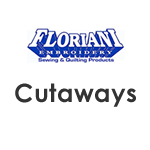 The high quality of Floriani Stabilisers ensure beautiful embroidery on all your projects. Be it Tearaway stabiliser, Water Soluble stabilisers, Cutaway stabilisers or backing fleece, you'll find everything you need in our stabilisers category. Deciding on the ideal stabiliser might take a bit of time, effort and trial. 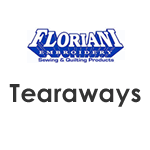 We will explain how you can make sure you are choosing the ideal embroidery stabiliser to suit your individual needs. When using a cutaway, it’s important to understand that it attaches itself to the fabric that you are using, as heat removable and water soluble, tear away are able to be removed once you are finished. stabilisers that fuse are joined to the cloth by heating them with an iron and stabilisers that stick use a special type of adhesive to bind it to the fabric. These types of stabilisers come in a selection of sizes that are made to fit different types of hoops. Each one of the stabilisers listed above has a certain purpose and are each suitable for different types of fabrics. The tear away type works by tearing off when you are finished sewing. This type of stabiliser should be used on thick and solid fabrics like denim. 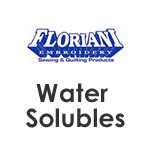 Water soluble stabilisers dissolve when they’re washed. These types of stabilisers are best used on sensitive fabrics such as silk or lace. Heat removable stabilisers are designed to flake away when they’re ironed. This is an ideal choice for types of fabrics that can’t be wet, such as velvet. Lastly, cutaway stabilisers are a bit more versatile and are ideal for making patches or small emblems. Cutaway stabilisers work best on very thick and moderately thick materials. It’s a good idea to make a list of which stabilisers have worked the best for you and for which fabrics, so that you’ll have an easy reference when you begin working with the same types of fabrics again. Keep in mind that this is a process of trial and error and can take some time to find the most suitable stabiliser for your project’s need but the more you continue to experiment the more you will learn about which stabilisers are best.